To date, the majority of the releases for Symbaroum, the dark fantasy roleplaying game published by Järnringen and in English by Modiphius Entertainment, have been scenario anthologies, such The Copper Crown, the Symbaroum: Gamemaster Screen which included Adventure Pack 1, and Adventure Pack 2. All that changes with the release of the Advanced Player’s Guide, a supplement which greatly expands upon the options for players in the design of their characters; recategorises occupations as well as providing new ones; adds boons and burdens; offers new Races; and even gives away one or two of the secrets to the setting of Symbaroum. As much as the contents of the Advanced Player’s Guide adds to the game, all of it is optional. Not only that, but it is explicitly stated in the book that the contents are optional, which is important because this supplement changes many elements of Symbaroum. The Advanced Player’s Guide is divided into three sections—The Characters, The Skills, and The Tools, each further divided into various chapters. The Characters sections opens with an expansion of the roleplaying game’s archetypes. In the core rules, there are just three Archetypes—Warrior, Mystic, and Rogue, but this set up the oddity where essentially the Hunter occupation fell under the Rogue Archetype. It felt out of place. Here the Hunter becomes an Archetype of its own, with the Witchhunter and Ranger occupations from the core rules being joined by the Iron Sworn, Bounty Hunter, and Monster Hunter all falling under its category. In addition, the Archetype is given a unique ability, in this case, Hunter’s Instinct, which makes a Hunter better at hitting a target or quarry. It is unlocked and can be selected once a player character has taken three other abilities from those suggested for the Archetype. Of the occupations, the Iron Sworn, who works to maintain the Iron Pact, is actually a Profession. This is actually an advanced occupation, something not available at character creation, but available through play and the expenditure of Experience Points. The Advanced Player’s Guide does this in turn for the Warrior, the Mystic, and the Rogue. So for the Warrior, the new occupations are the Tattooed Warrior, Rune Smith, and Weapon Master with the Templar, who serves the Church of Prios, and the Wrath Guard, who serves the High Chieftain of the Karvosti, being the Professions. The Mystic has more Professions than new occupations—eleven versus two! The latter are the Symbologist and Troll Singer, whilst the former are the Artifact Crafter, Staff Mage, the White Path of Witches Spiritualist, the Red Path of Witches Blood Wader, Demonologist, the Green Path of Witches Green Weaver, Illusionist, Inquisitor, Mentalist, Necromancer, Pyromancer, and Confessor. The Queen’s Spy and Gentleman Thief are the Professions for the Rogue, whilst its standard occupations are the Former Cultist, Guild Thief, and Sapper. As much as this opens up the options for characters with the Warrior, the Mystic, and the Rogue Archetypes and now the Hunter Archetype, and is all the more welcome for that, there is an imbalance in terms of Professions for the Mystic Archetype versus those of other Archetypes. Another issue becomes apparent when considering the new Races added in the Advanced Player’s Guide. These are Elves, Abducted Humans, Dwarves, Trolls, and Undead. These are Summer Elves tasked with enforcing the Iron Pact, the agreement which protects the dark secrets of the Davokar forest; Abducted Humans are the children taken by the Elves when they leave Changelings behind and who grow up to serve the Iron Pact; Dwarves value their families above all, including morality and law; Trolls are crafters, singers, and warriors from below the earth who learn through song and challenge; and the Undead are a recent phenomenon, individuals returned from death for reasons unknown. The races are given the same treatment as those in the core rulebook, the section explaining why each member of that race might become an adventurer providing both motivation for the player and a hook for the campaign for the Game Master. The issue with many of these new character options is that they lend themselves towards learning more of the secrets to the setting of Symbaroum. For example, the Abducted Human would be expected to know of some of these secrets, having spent time with the Elves. Similarly, the Staff Mages, said to be the descendants of the order of warrior monks who protected the last emperor of Symbaroum, and live and train in a castle deep in the Davokar forest, could be expected to know something of the forest’s secrets. Yet as much as the Advanced Player’s Guide is not the book to present such secrets, you almost wish that it did given that so many of the new character options are more deeply embedded in the setting. Even the two new traits, Wisdom of the Ages and Earth Bound, given in the Advanced Player’s Guide which support the strangeness of the Elves and the Dwarves in the setting, do not give any of the setting’s secrets away. That said, neither the new races new the new Professions are aimed at players new to the setting of Symbaroum. They are instead aimed at players who have some experience of the setting. Certainly, the Professions support this, being something that the players and their characters can aspire to, whereas the new races are better suited for replacement characters. Indeed, the option is given for player characters who are killed in the course of the play to come back as Undead. Where abilities provide active skills, knowledges, and powers, the new Boons and Burdens provide advantages and disadvantages in social situations and for solving problems rather than doing things in combat. Boons can be purchased using Experience Points during play or a couple selected during character creation for a Novice level or balanced against selecting a Burden or two. Some Burdens can be purchased up to three times. For example, Archivist grants a +1 bonus when researching libraries and archives and can be selected three times. In general, Boons and Burdens help a character flesh out, but it is recommended that a player only take a few so as to not make the character too complex to play. The third section, The Tools, is the shortest and provides a miscellany of new rules and equipment. They include alchemical weapons, such as the fire tubes and mines used by Sappers; Feats, heroic actions like Quick Strike and Steely Gaze which cost Experience Points or Corruption to use; and rules for traps and their setting and disarming, earning money between adventures, combat manoeuvres like Careful Aiming and Knock out, taking monster trophies, making pacts with ancient powers, as well as using Hit Locations and character Reputation. Lastly, the equipment covers everything from arms and armour to siege equipment and lesser artefacts—the latter possibly available for sale or to be found, but also can be constructed by Artefact Crafter. In amongst the new rules and character options, it should be noted that the Advanced Player’s Guide does include some background information and even some secrets to the background. Of the former, there is mention of monster hunting societies, demonology, siege warfare, and more, whilst the latter discusses the origins of humanity, the links between Goblins, Ogres, and Trolls, and so on. This is in addition to mentions of places beyond Symbaroum. Now none of this gone into in any depth and again, the frustrating feeling of secrets not revealed may be an issue for some. Nevertheless, there are little snippets of information here that will not only intrigue Game Master and player alike, but also serve as possible hooks for a Game Master’s campaign. As you would expect for the Symbaroum line, the Advanced Player’s Guide is a superb looking book, clean and tidy, but with fantastic artwork which captures the gloom and grit of the lives of the people of the region as well as grandeur of some of its dangers and places. Simply put, the Advanced Player’s Guide is as good a looking book as you would want. A decent index should help the reader everything they need, although a combined index for both this supplement and the core rules would have helped. The biggest issue with the Advanced Player’s Guide is whether or not a playing group decides to embrace its contents. It adds an enormous amount to the game, expanding greatly what the player characters are, what they can be, and what they can do. 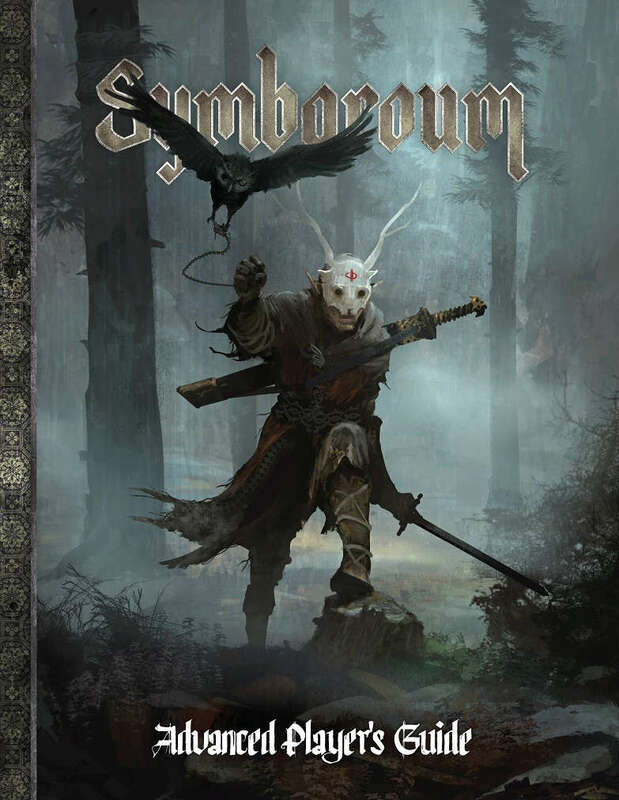 The range of options available means that everyone may have almost too much to choose from between Symbaroum Core Rulebook and the Advanced Player’s Guide, and with that range, the roleplaying game itself may lose some of the focus to be found in the core rules and the first few adventures. Further, some character types may not be suitable for every type of scenario or campaign that the Game Master may want to run. The effect of the new rules and options also needs to be gauged when a playing group decides to add them to its campaign. Certainly, some of them, like the Feats, do pull Symbaroum away from its grim and gritty tone, as they add an element of heroism to the game. Similarly, the addition of the new races, especially the Elves and the Dwarves, do push the game towards being like any other fantasy roleplaying game. In their defence though, their treatment here is still grim and they do feel different to approaches taken to them in other roleplaying games. That said, the challenge imparting this difference to the players is one reason why they are advanced options. Ultimately, everything is optional in the Advanced Player’s Guide. Some of the options are logical, even necessary, such as the recategorisation of the Archetypes, but for the rest, that is very much a matter of choice. The Advanced Player’s Guide provides a wealth of fascinating and fantastic options that expand the game, enabling players to create interesting player characters and the Game Master to create interesting NPCs.